Drawing an Angle | Constructing an angle | How can I Draw an Angle? We will discuss here about drawing an angle. Suppose, let us draw an angle of 50°. To draw an angle we follow the steps given below. Step I: First we draw a line segment say XY. 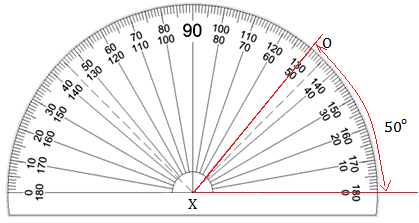 Step II: Now place the protractor in such a way that its straight horizontal edge is placed on XY and its centre is on X as shown in figure. Step III: Starting from zero from the right, we start reading the scale on the protractor. We mark a point at 50° mark on the paper as shown here. Step IV: Name the point marked say, O and join the points O and X with the help a scale. ∠OXY = 50°.